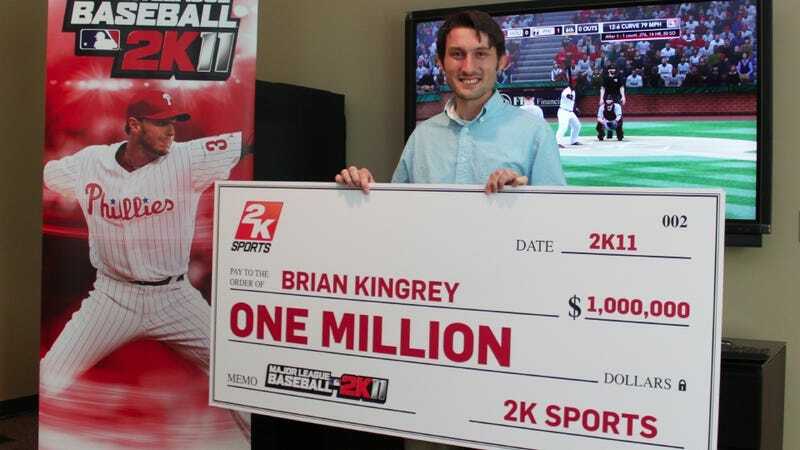 • The New York Post profiled Wade McGilberry and Brian Kingrey, the two previous winners of the Million-Dollar Perfect Game challenge in the MLB 2K series. McGilberry and his wife, Katy, have an 8-month-old son now, named Braxton. The couple chose to start a family thanks to the financial security Wade's winnings provided. As for Kingrey, he starred in a commercial with supermodel Kate Upton and MVP pitcher Justin Verlander. "[Upton and Verlander] seemed to have more questions about me than I did about them. I was kind of like the ugly duckling there," he told the Post. "All of those people are so handsome and so pretty and well-built and I'm this scrawny gamer." • Ubisoft picked all-star Minnesota Timberwolves power forward Kevin Love as the first member of a four-man celebrity "Team Ghost" meant to promote the upcoming Ghost Recon: Future Soldier. "Just like on the basketball court, my role on this team is to be a long range shooter," Love said, in a quote almost certainly written by a publicist. "After winning the three-point contest this year, I proved that long range is my specialty so I'll be a sniper on this squad." Love isn't a ringer, he has FPS chops, as Evan Narcisse wrote in an interview for Time before joining Kotaku. • Midway through the second round of voting, Madden NFL 11 star Drew Brees looks to upend darkhorse favorite Ray Rice in the Madden 12 cover contest's toughest matchup of the early rounds. ESPN reports that Brees has a 51 to 49 percent advantage over the Baltimore Ravens' running back. The winner of that round will face either Packers quarterback Aaron Rodgers or Seattle running back Marshawn Lynch. Voting on the second round concludes on Wednesday. • NHL 13 produced this hype video for its cover-vote contest, celebrating its cover stars' successes in the year of their appearance, as opposed to some curse or other regression to the mean. It's a nice three-year winning streak for the honorees, though Dion Phaenuf, the star of NHL 09 had a frustrating 2008-2009 campaign that included career lows in goals and points. • For whatever it is worth, NBA 2K13 has already been dated by some retailers. It's listed for Oct. 2, which is the first Tuesday of that month, traditionally when NBA video game products release.